RIP Giants’ Offense. All three wide receivers for the Giants departed with ankle injuries, the worst being Odell Beckham Jr. with a broken ankle. This week was another brutal week thanks to injuries. Bilal Powell exited early with a calf injury, Charles Clay was carted off the field with a knee injury, and DeVante Parker also left with an ankle injury. Here are some players to look at to once again fill the holes on your fantasy team. 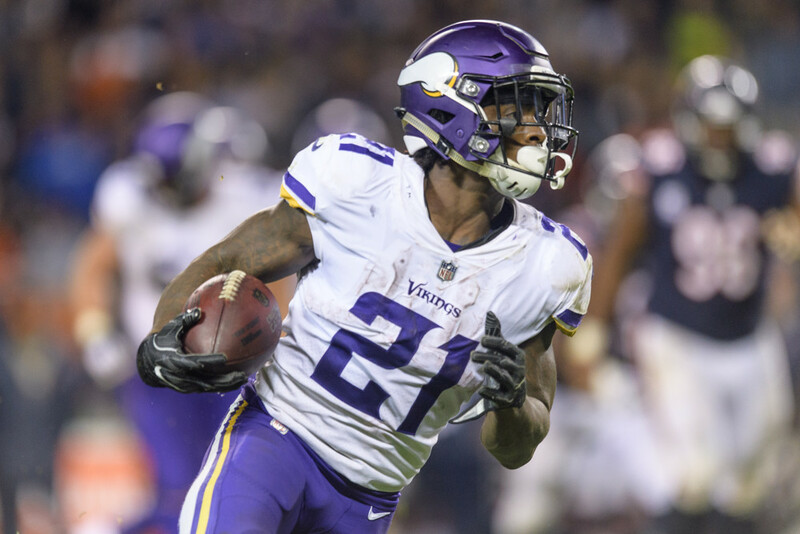 It was a little hazy on who was going to be the back to own in Minnesota, but Jerick McKinnon made a huge case last night against the Bears. McKinnon rushed 16 times for 95 yards and 1 touchdown, and was the leading receiver, catching 6 passes for 51 yards. McKinnon has the speed to hit holes, whereas running back Latavius Murray is more of a power back. He rushed 12 times for 31 yards and looked slow. McKinnon looks like he has earned more of the starting role here, but it will probably still be a timeshare. The plus side is the offensive line is better than it was last year, so McKinnon should have more running room. Either way, McKinnon should be owned in 10 team leagues. Matt Breida has been considered one of the top handcuffs to own all season, and it looks like his time for usage is getting closer. Carlos Hyde sat some of the game due to a nagging hip injury, and Breida turned the opportunity into 49 yards on 10 carries and 22 yards on 3 receptions. With Hyde’s injury history, it may be a matter of time before he sits. If or when he does, Breida will have full control of the backfield. He is more of a deeper league addition, but he may be worth a look in 12 team leagues as well. Aaron Jones was electric in Sunday’s game against the Cowboys. He ran 19 times for 125 yards and 1 touchdown; a run game Green Bay hasn’t seen in a long time. Jones also caught 1 pass for 9 yards. Jamaal Williams only got 1 carry the entire game. With Ty Montgomery nursing broken ribs, this game may have shown that the Packers can let Montgomery rest. The Packers have 2 more games before their bye week, so it’s not crazy to think they will keep Montgomery out. Jones should be added to all leagues, and easily has become a solid handcuff to own. Odell Beckham Jr broke his ankle. Brandon Marshall was carted off the field with an ankle injury. Sterling Shepard left the game and has an undisclosed ankle injury. That leaves us with Roger Lewis, the only WR to walk away from the game unscathed. He caught 1 pass for 29 yards and 1 touchdown on Sunday vs the Chargers. Lewis looks to be the only healthy receiver on a pass heavy team for now, and would still be heavily involved once Shepard returns. Lewis should see a ton of volume, and is worth a look in 10 team leagues. Elijah McGuire didn’t make this list last week, but a leg injury to Bilal Powell could spell big games for McGuire. McGuire handled most of the work on Sunday, rushing 11 times for 20 yards. He added 2 catches for 10 yards. This may look pretty bad, but Cleveland has had a surprisingly good run defense this year. With Matt Forte looking to be out for some time with turf toe (lingering injury normally) and Bilal Powell potentially missing time, McGuire should see plenty of work. The Jets get New England and Miami the next two weeks, so McGuire has good opportunity to run wild. He should be added in all leagues on RB needy teams. Just remember that Powell and Forte will get their jobs back when they are healthy, so McGuire may only be a few weeks’ worth of fantasy relevance. Alex Collins rushed 12 times for 55 yards in Sunday’s game against the Raiders. Terrance West went down with an injury, which means Collins should have even more of a share of the running snaps. Buck Allen did rush 21 times, but most of this came in “garbage” time after Baltimore was up by a few touchdowns. With West looking to be out and Allen continuing to mainly play 3rd downs, Collins is still a good add in 12 team leagues. If the Baltimore offense begins to click, he may be worth adding in 10 team leagues as well. Nelson Agholor had his 2nd big game of the year on Sunday, catching 4 passes for 93 yards and 1 touchdown (his 3rd TD of the season). With Carson Wentz having a solid start to his season, as well as the running game struggling with injuries, Agholor has seen an increasing amount of targets. You may not want to start Agholor against Carolina on Thursday, but he faces Washington and SF at home the weeks after that. Agholor should be owned in 14 team leagues, and may be worth an add in 12 team leagues. Who? That’s what many probably thought when they read his stat line on Sunday. Ed Dickson had 175 yards on 5 catches. This is coming after a solid 3 reception for 62 yard game in Week 4. Cam Newton is starting to get hot, and has built chemistry with Dickson, who is seeing a big role thanks to the Greg Olsen injury. Dickson is trending upwards, and is a solid option if you need a TE or lost Charles Clay last week. I’m keeping him on here until news on Ezekiel Elliott comes out. If Zeke is suspended, Darren McFadden will be a potential league winner. He is worth a bench spot as of now. If Zeke is not suspended, McFadden can be dropped.